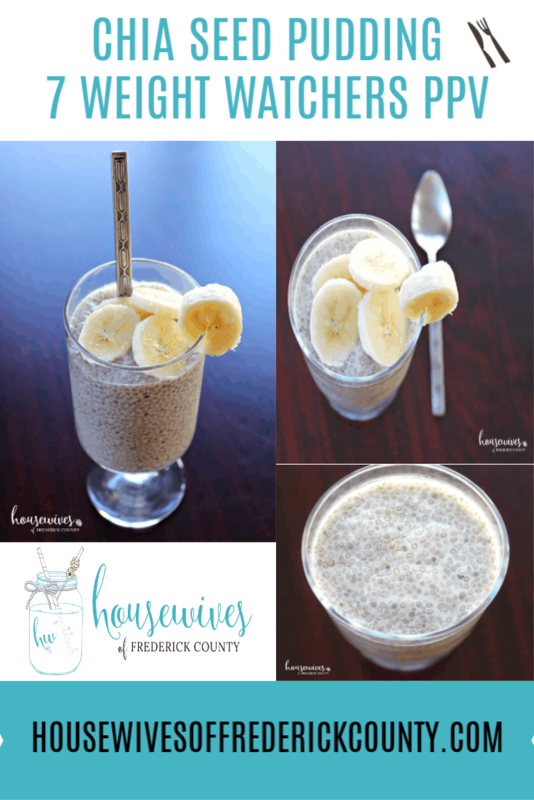 This Weight Watchers friendly Chia Seed Pudding recipe will make you so happy because it’s tastes so good, it’s super good for you, and it’s ridiculously easy to make! I just love me some pudding! I usually like to make the Pistachio Jello Instant Pudding & Pie Filling and add whipped cream on top. It’s such a nice treat at the end of the day, but probably not the most healthy or filling. I’ve been looking for a pudding that has more mmmph to it health-wise and filling-wise. In a recent issue of Family Circle Magazine, I found a page of ‘Power Breakfasts’. Smoked Salmon Crackers, Veggie Egg Scramble, Green and Blue Smoothie, Egg, English Muffin, Nut Butter, and Fruit, Overnight Oats, Avocado and Egg Toast, AND Chia Seed Pudding. I decided to try out the Chia Seed Pudding first. 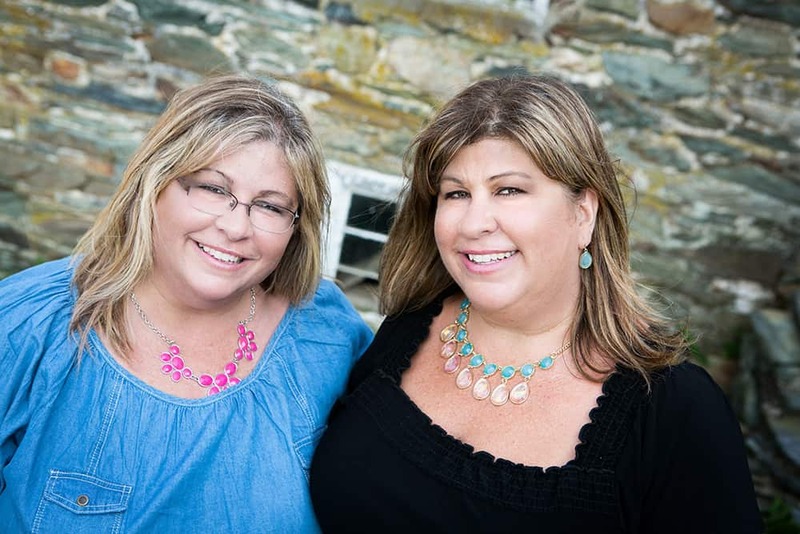 This recipe states that it is 7 Weight Watchers Point Plus Value. However, others who have tried it have said that they split this Weight Watchers chia pudding into 2 servings because it is so filling, so technically it is 3.5 Points Plus Value per serving. And with the new Smart Points system, per serving, this Weight Watchers chia pudding is 6 Smart Points. 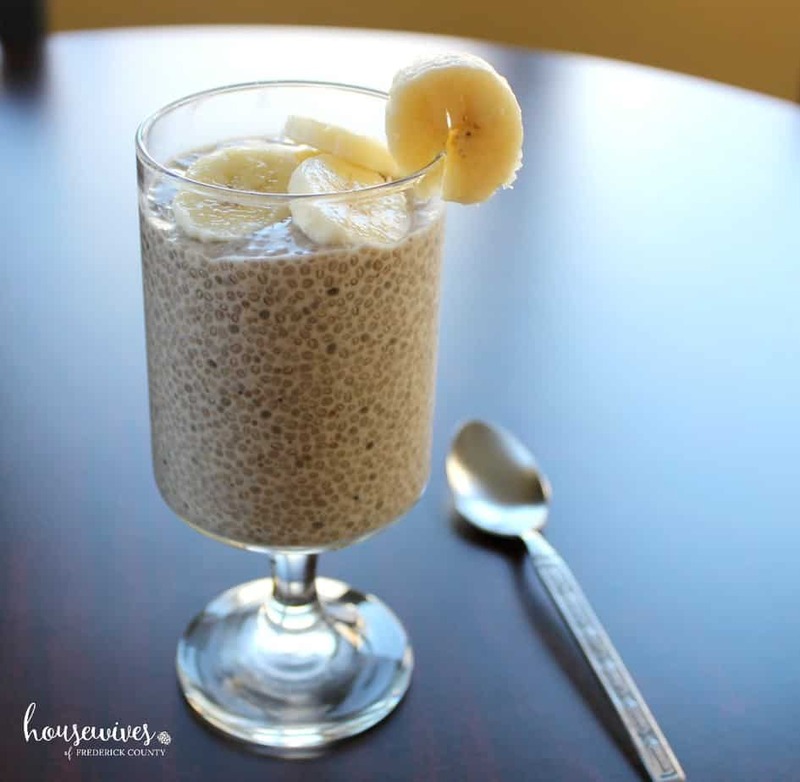 I was a little bit apprehensive when I saw the picture and the recipe for Chia Seed Pudding. But I was enthralled too and have seen the buzz about chia seeds and chia pudding a lot lately. It resembles tapioca or rice pudding. I like tapioca and rice pudding so I figured I’d like this chia seed pudding too. 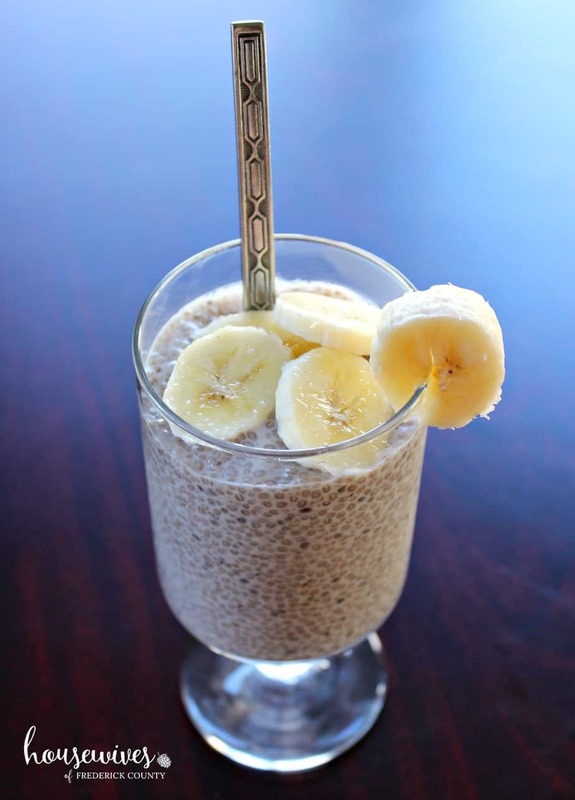 The great advantage of chia seeds over tapioca and rice puddings (both starches) is that chia seeds offer a powerful punch of protein (about 5 grams per serving), fiber (10 grams per serving), calcium (17% RDA), omega-3s, and antioxidants. Antioxidants from chia seeds are higher than any other whole food, even blueberries. Here’s a great book on Chia with information on why it’s such a great superfood, along with recipes. 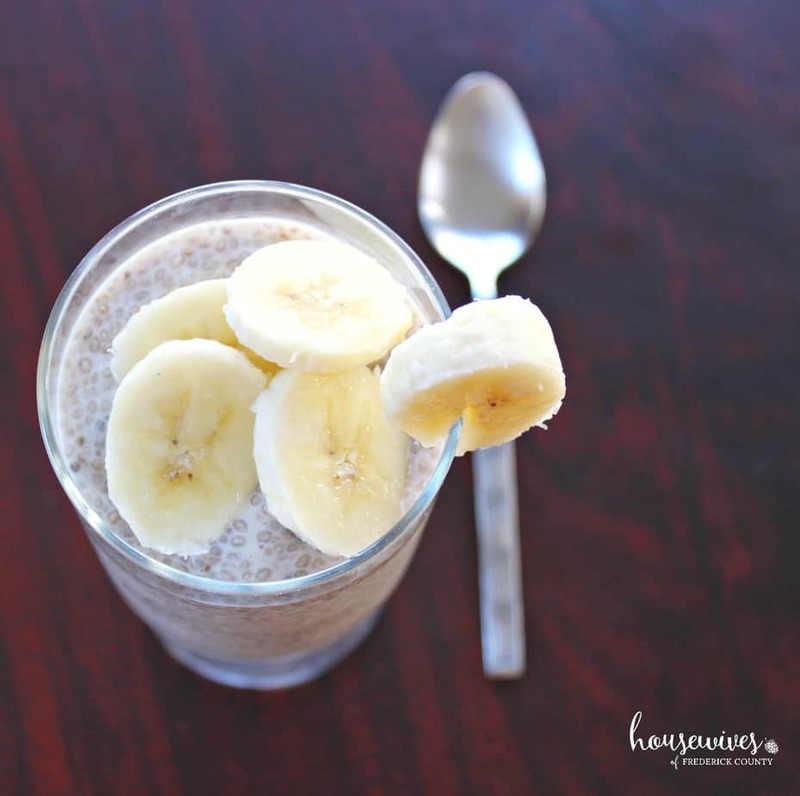 The Weight Watchers chia pudding recipe is ridiculously easy to make. I did have to add more chia seeds to thicken up the pudding though. 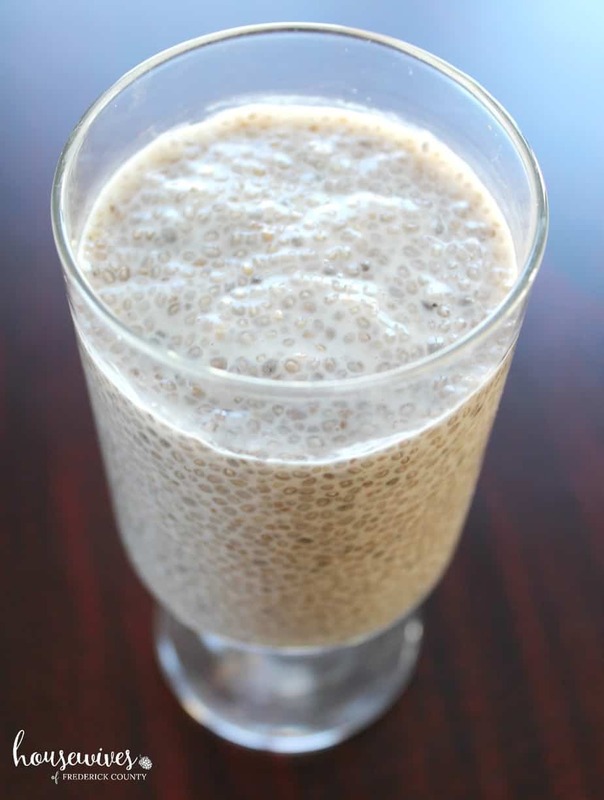 Chia seeds absorb 10 times their weight in liquid and convert it into a pudding type consistency. This is why using chia seeds to make a pudding is very popular. The below Amazon link has a nice little 4 piece set of glass pudding bowls, the perfect serving bowls for chia seed pudding. This recipe suggests you eat this pudding for breakfast, but I’d be just as happy eating it in the evening after dinner as a dessert. After my pudding was at the desired thickness, I added some sliced bananas on top and tried it out. It was so refreshing knowing that I was indulging in something really healthy for me. I liked the little crunch from the seeds and the taste of the almond milk with vanilla and honey was just right. 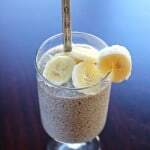 In addition, there are so many topping possibilities for chia seed pudding: coconut and pineapple, apples and nuts, blueberries, strawberries and bananas, the list goes on and on. I’ve even seen chocolate chia pudding on Pinterest. Gotta try that! I’m so excited about my new chia seed discovery that I’m looking for other ways to eat it. This morning I topped my yogurt with chia seeds. Keep in mind, each serving has 10 grams of fiber. Whisk chia seeds, milk, vanilla, and honey together. In the morning, add 1 banana sliced. I purchased my white chia seeds from Wegmans. Surprisingly they were hard to find. The dark chia seeds are much easier to find. If you can’t find white chia seeds in your local supermarket, you can buy them here from Amazon. 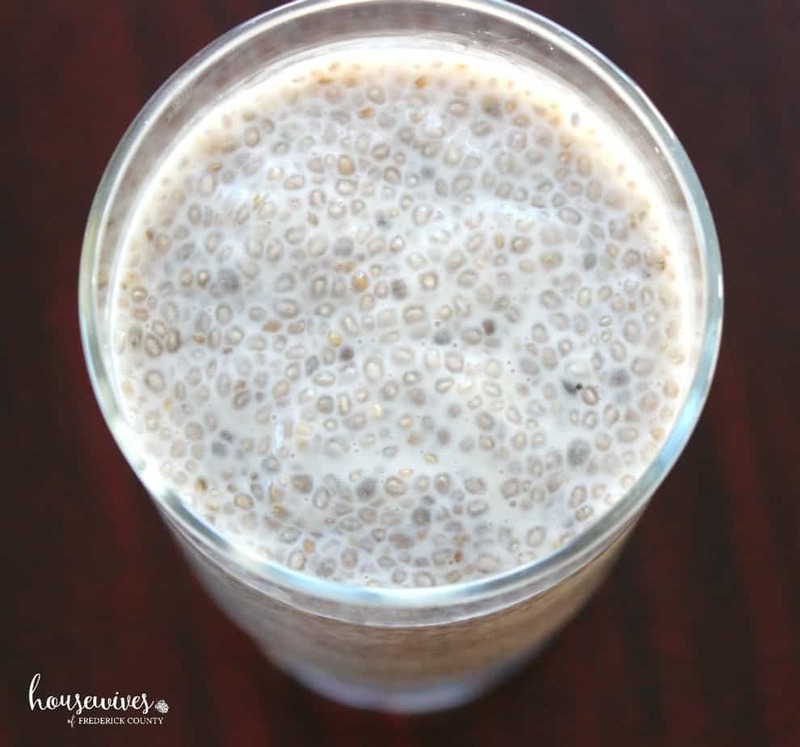 Have you ever had chia seeds before? And I don’t mean the old way of using them by spreading them onto a clay pot to make a chia pet! Yes, they’re the same chia seeds. Let us know in the comments how you prefer to eat them. I make mine like this, but I also add cinnamon. That sounds really good Claire to add cinnamon. I’ll have to try that next time. Yes, it was hard for me to find the white chia seeds. How long does the pudding stay good in the fridge? OMG! I made this last night and just tasted a spoonful. OMG! I am the Sweet Tooth Queen and just a spoonful or two will satisfy any craving for a dessert or sweet snack. I am too Gwendolyn! So glad you like it as much as I did! Hi Karena, The recipe makes one serving. It’s a little over a cup of chia seed pudding. How many smart points in a serving? I don’t know how to calculate Smart Points. I’m from the Points Plus Value days. Sorry I can’t help you!